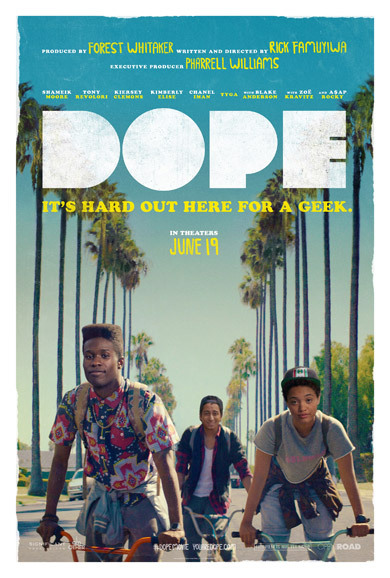 Dope is a coming-of-age comedy/drama for the post hip-hop generation; its main characters are obsessed with ‘90s hip-hop. Malcolm (Shameik Moore) is warily surviving life in “The Bottoms” in Los Angeles, while juggling college applications, academic interviews and SATs. His dream is to attend Harvard. A chance invitation to an underground party leads him into a gritty adventure filled with offbeat characters and bad choices that could allow him to go from being a geek to being dope to ultimately being himself. Open Road Films will release the film nationwide on June 19, 2015. ABFF Independent is a showcase of popular and award-winning films from the American Black Film Festival (ABFF) hosted by hip-hop artist, record producer and actor David Banner. An Unexpected History celebrates Moët Hennessy’s hundred-year relationship with African American culture, as well as the role of African Americans in shaping the brand’s identity and success. The film recounts Hennessy’s historic role in bringing respect and opportunities to Black professionals and consumers, by focusing on the remarkable achievements of two of the brand’s most influential Black executives. ABFF remembers John Singleton’s classic saga of a group of childhood friends growing up in a Los Angeles ghetto. A Black man in NYC struggles with bipolar disorder, while his girlfriend and mother learn to deal with the pain of his manic episodes and struggle for mental survival. A pastor, an aging widow, and a socialite with cold feet visit a luxurious Gullah Sea Island resort to be rejuvenated by its holistic setting. Directed by: Dianne Houston | Written by: Christopher Brandt | Produced by: Gingi Rochelle & Allison Wilmarth | Cast: Lorraine Toussaint (Orange Is the New Black), Thomas Q. Jones (Being Mary Jane), Aisha Hinds (Star Trek Into Darkness), Leon Thomas (Victorious), A. Russell Andrews (Grey’s Anatomy, House of Payne), Erica Tazel (Justified), Melanie Liburd (CSI, Stalker). Inspired by nostalgia and a romantic idea of family legacy, hip-hop artist and songwriter Che “Rhymefest” Smith decides to purchase his childhood home on Chicago’s South Side and raise his new family in the same house where he grew up. He quickly discovers that his estranged father is a homeless alcoholic living only blocks away, and hesitantly sets out to reconnect with the man who abandoned him over twenty years ago. Soon Che finds that fatherhood is more complicated than his idealized version allowed him to believe.